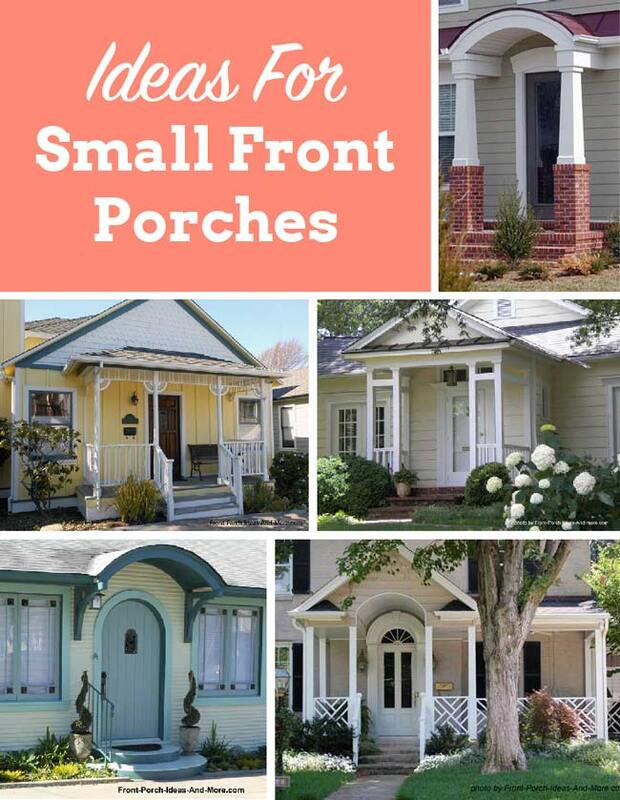 Do you have a small porch? Dave and I live in a geographical area that has many condos, apartments, and homes with relatively small sized porches. 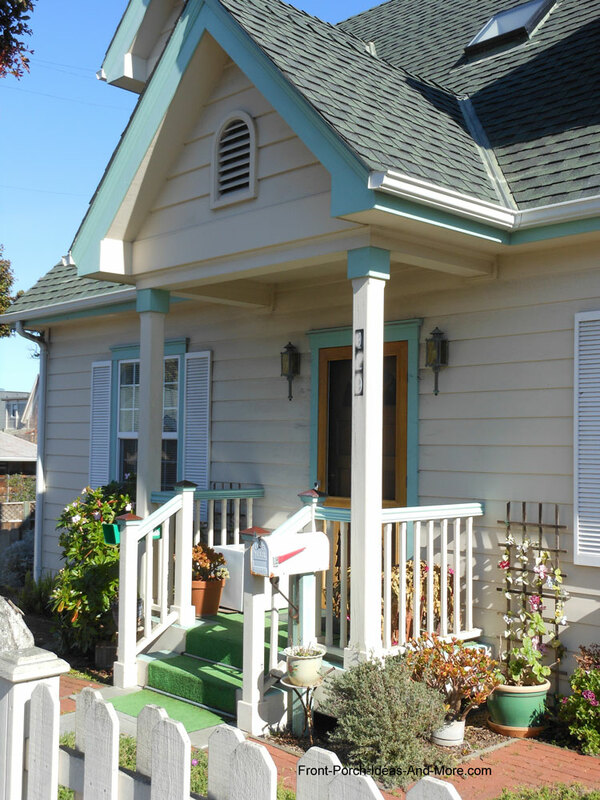 Unfortunately, many new homes are also built with small front porches to minimize construction costs. Often times, a large porch is just not an option. 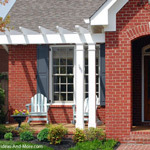 You can increase the curb appeal of a small front porch and even extend it so as to create more outdoor living space. 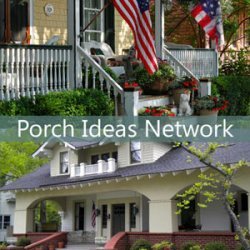 Our photos, porch designs, plans, decorating, and landscaping ideas will surely inspire you to create what Mary and I call "porch envy"! 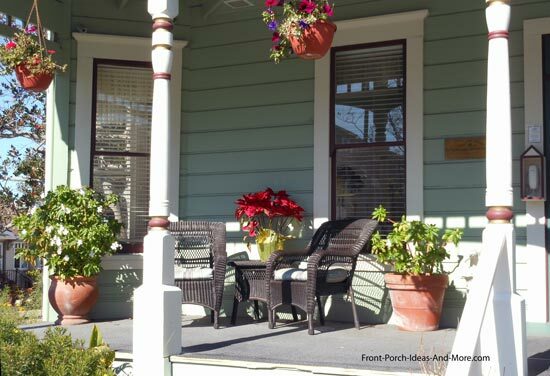 "Turn the ordinary into extraordinary"
We want you to enjoy the world of porches. We have many ideas, designs and plans for you to explore. 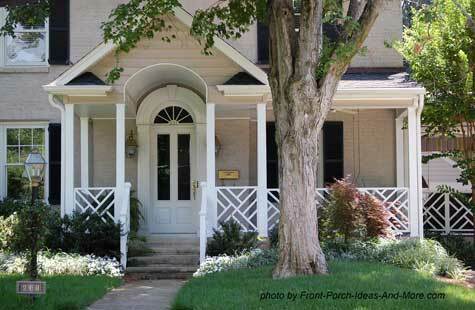 Porch designs are based on mostly these visual structural features: the roof, porch columns, and porch railings. 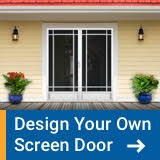 Change any one and you change the overall attractiveness of not only your porch, but also your home as well. 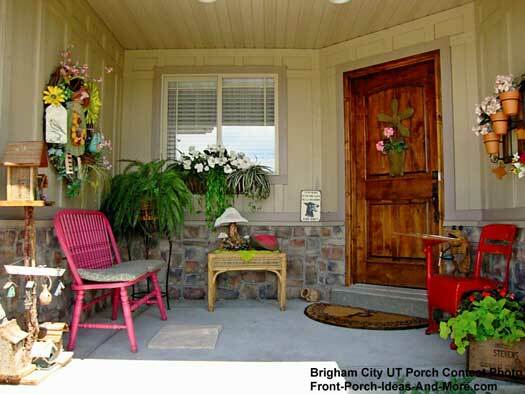 Use our porch pictures below to find the right combination of these features from which you can create your delightful porch. 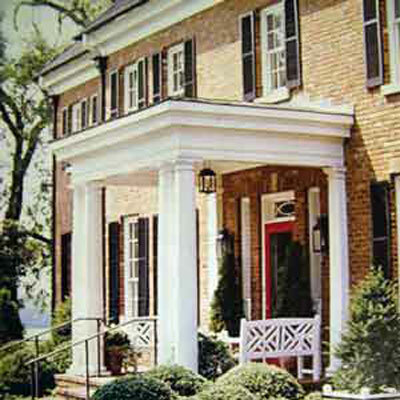 Then use our porch railings, columns, and roof sections to nail down exactly the look you want. 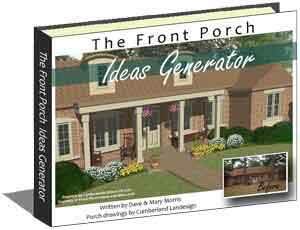 You can even use our Front Porch Generator to see how different features affect the overall charm of a front porch. 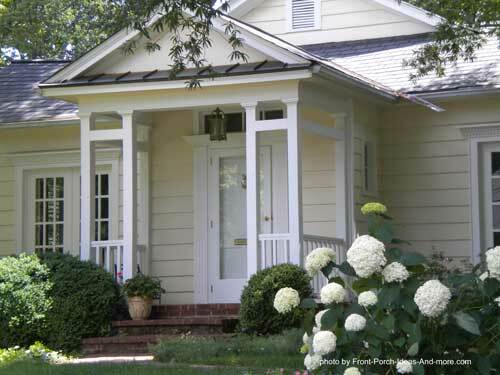 The lines of the roof and door complement each other on this smaller porch (or portico). Also note the rounded steps which continue the architectural lines. Although this is a very small porch it is still offers lots of interest and charm. 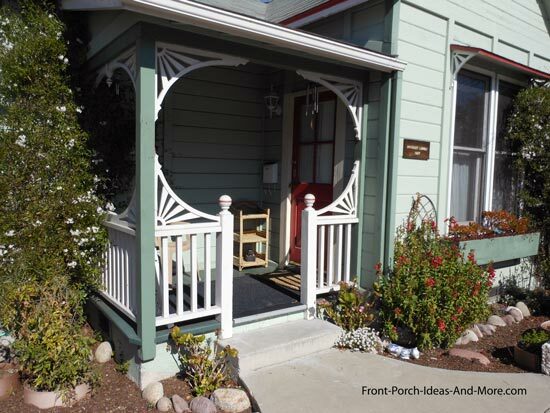 Notice how this smaller porch is dressed up with this decorative lattice in an arch style. The curb appeal is boosted and it also adds some privacy and a bit of filtering for sunlight. The same architectural style can have different effects as depicted in the pictures. 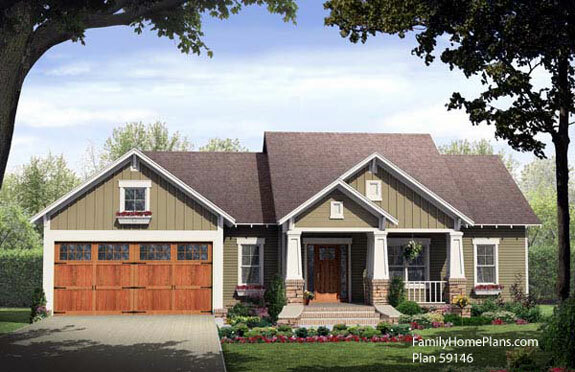 The one on the left is more formal and substantial in appearance whereas the one on the right has a more country feel with its standing seam metal roof and bead board ceiling. 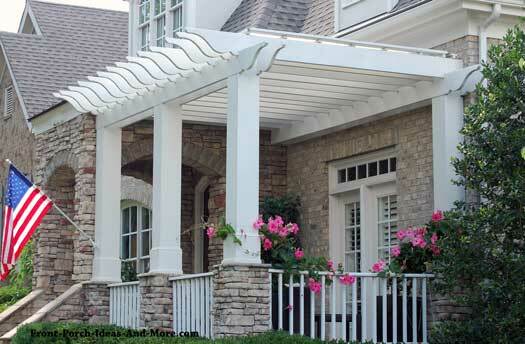 This type porch roof can work well when there is insufficient space for a gable roof. 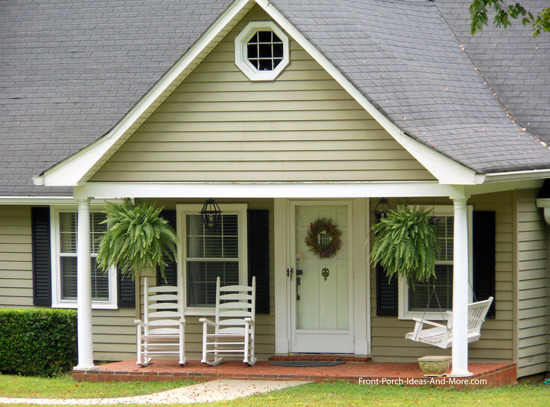 Gable roof height is directly correlated to the length of the porch. Therefore, the longer the porch the higher the gable. Unless originally designed for a gable roof, it is often difficult to add a gable to a two-story home unless other modifications are made such a moving windows. Adding a gable to a ranch-style home is far easier in most cases. The photo above is a good example of a high pitched gable roof over a small-sized porch. Local building codes might require a high pitched roof which is designed to shed heavy snows more easily. 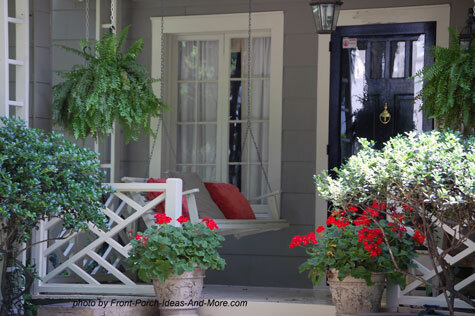 What a sweet porch with an inviting porch swing. Do you see the adorable mailbox? 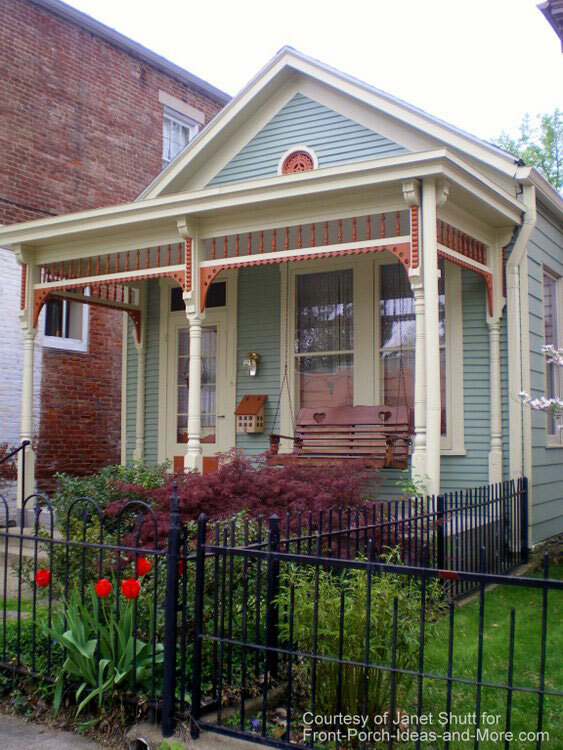 Just a lovely small home with Victorian touches. 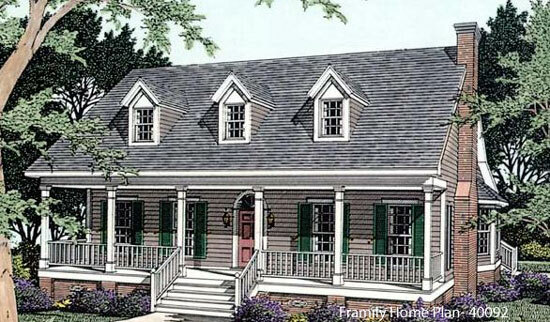 The photo below uses a flat roof design over the porch. An additional patio area with a pergola has been added to increase the outdoor living space. 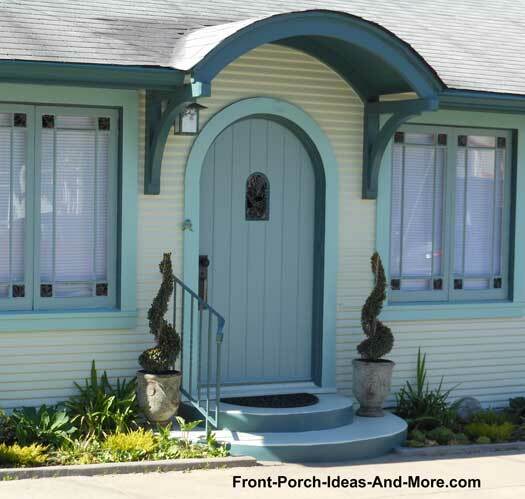 This is a great way to increase the size of a small porch. In the photo above, the flat roof covers a corner-style front porch. Porch design with a combination gable roof over the entrance and shed roof spanning the remaining porch. 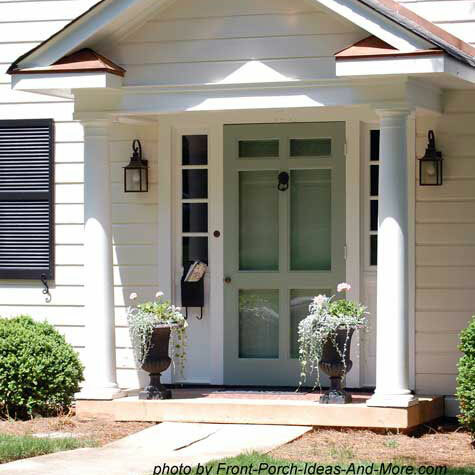 This is a very popular small front porch design with plenty of flair. 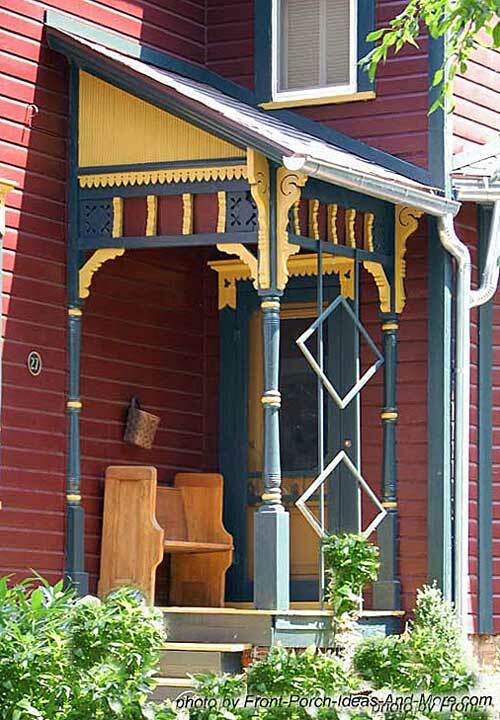 Mary and I really like this porch design (above). It is another example of a combination gable and shed roof design along with an attractive Chippendale-designed balustrade (railings). 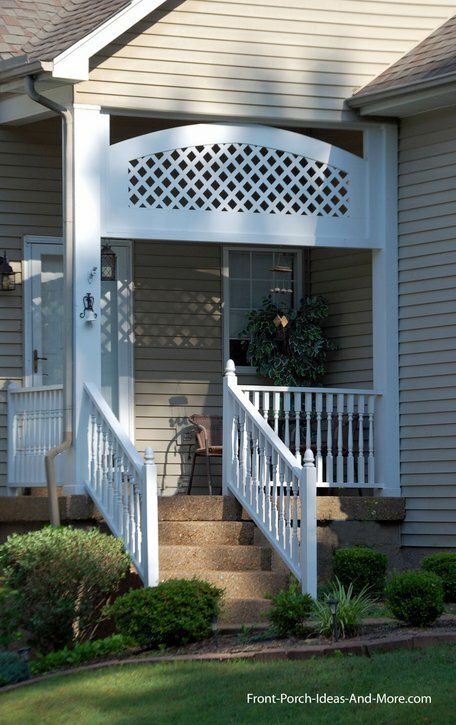 Decorative railings can add visual flair to almost any size porch. This small porch has a hip roof. Hip roofs work well when there isn't space for a gable or a shed type roof. This is a well designed Arts and Crafts porch. 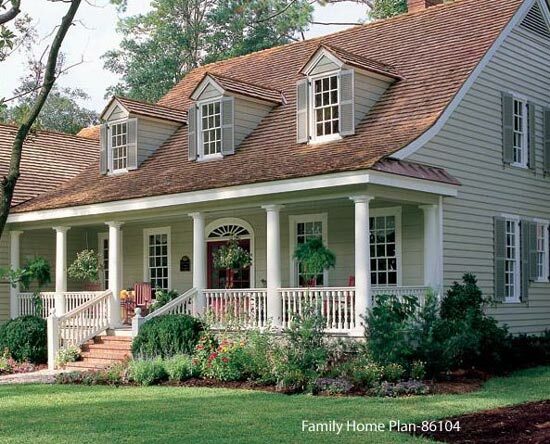 The porch roof mimics the home's roof lines and the larger columns make the porch more impressive. Note the generous landscaping which adds a truly pleasing feel to this home. 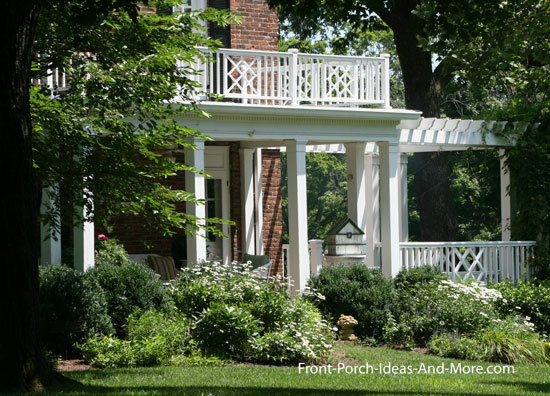 We've only begun to share our small porch design ideas with you. You will find plenty more photos and ideas you can use throughout our site; enjoy the journey. 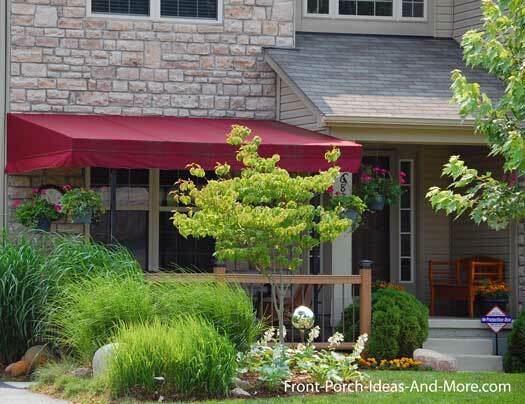 No matter the size of your porch, it can pack a punch! 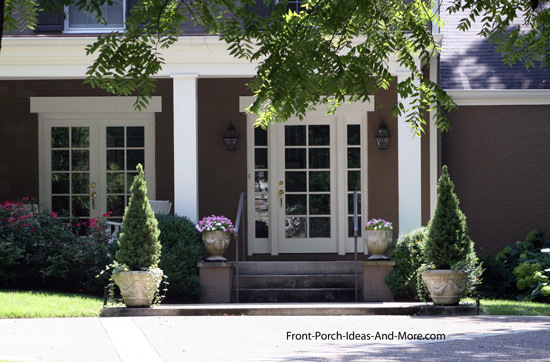 Use our small porch pictures along with our small front porch ideas to dress up your front porch. 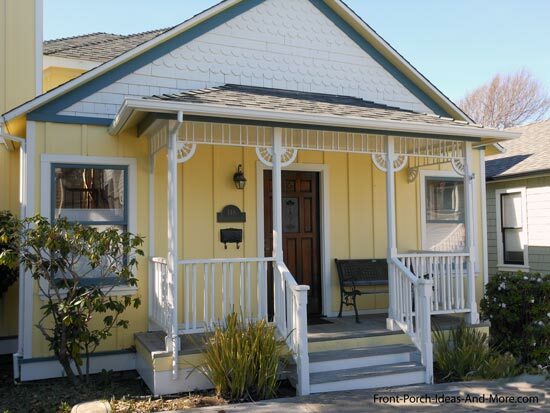 Notice the prominence of exterior house trim on the porches in the three photos below. Adding brackets, running trim, and spandrels (or in combinations) adds dimension and extra "wow" to your home. They are easy to install and are a quick and relatively inexpensive way to add decorative features to your porch. Notice the added touches in the photo above. We like the geometric trellis along with the wooden bench. The contrasting colors visually highlight the small porch and give it much more impact than if it were painted the same color as the home. 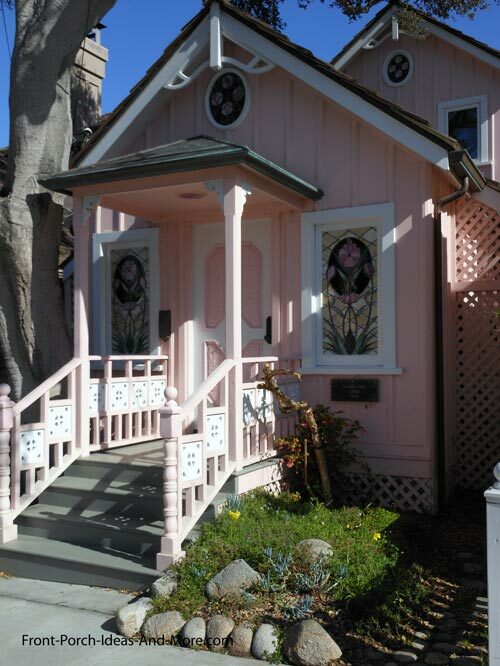 You can't help but notice this porch when you walk by - we sure did! 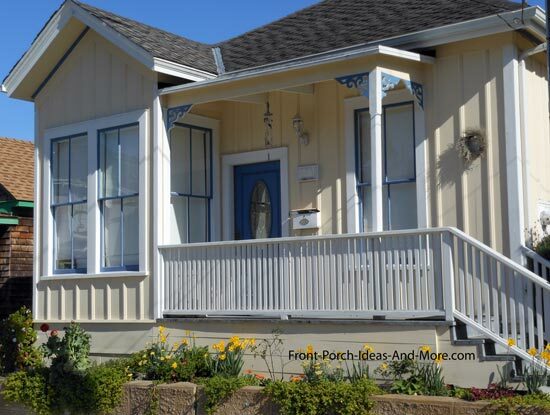 This is an innovative way to use exterior house trim on a small front porch. Although perhaps not everyone's cup of tea, you have to admit it is eye-catching and quite charming. 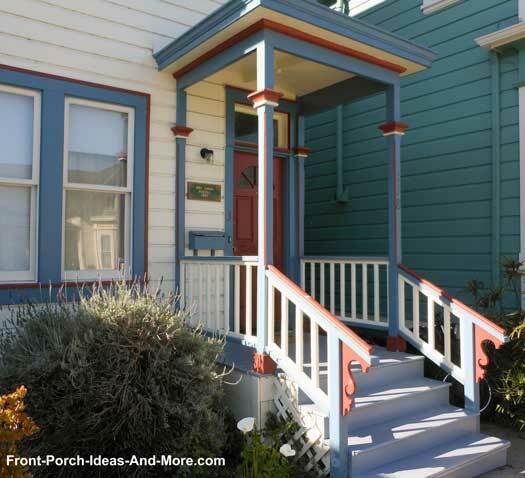 The photo above is a good example of the impact painting can have for a porch. 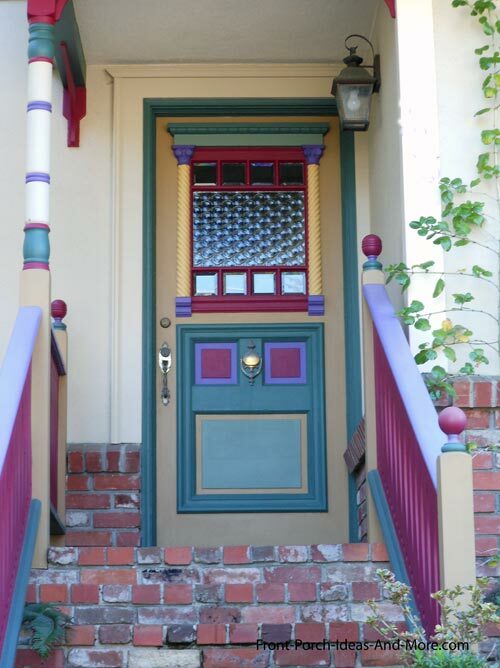 Notice the addition of color to the porch columns and column brackets. Unlike the previous photo, this porch's colors are carried over from those on the home itself to give it an entirely different look. Don't forget the furniture. 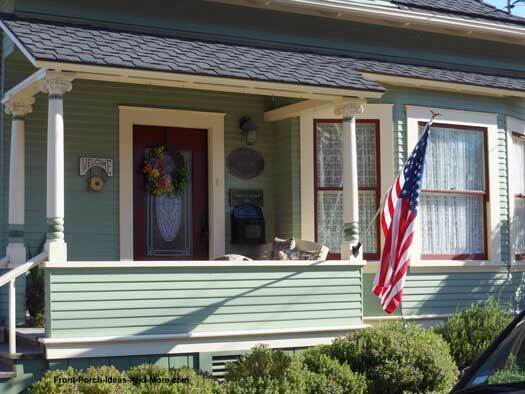 Notice how the furniture is painted in the same trim color adding to the porch's overall delight and charm. Your furniture's color can either add to or diminish the overall impact of your small porch so take care in selecting (or repainting) your furnishings. 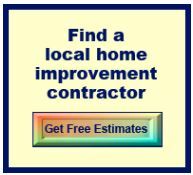 Visit our exterior house trim section. 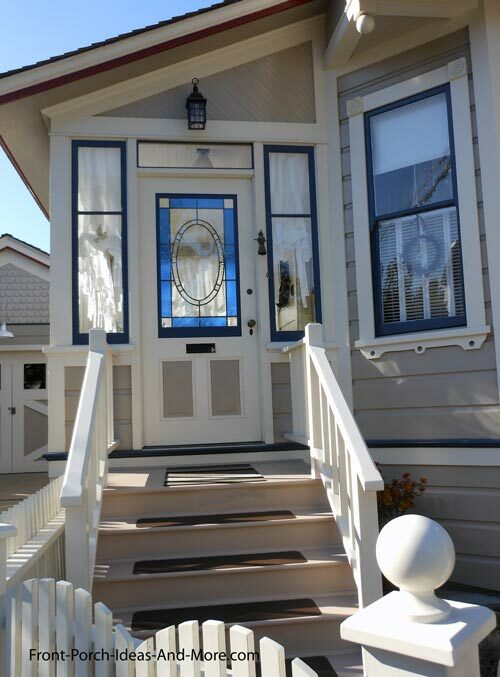 See examples on homes so you can find the perfect combination to enhance the look of your porch. 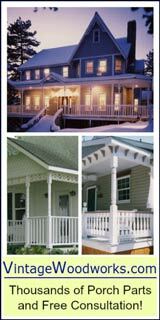 Changing out, wrapping, or painting your porch columns can help transform the look of your porch too. You can do this easily in just a few hours getting dramatic results. Anyone can do this. 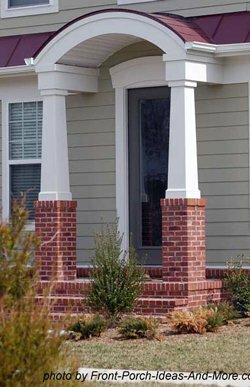 Use ordinary trim pieces from your local building supply store and add them to your square or rectangular porch columns (photo above). You can then paint them to match the color of your columns, your home, or other trim color depending on the effect you desire. A little paint will do 'ya. Your turned columns are a canvas waiting to be painted! As in the two photos above, choose either contrasting or complementary colors and have a go. A little paint adds a lot of flair. If you have round or square columns and want to change them column wraps may be the answer. 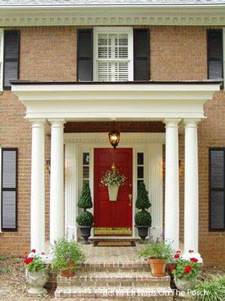 As the name implies, column wraps are fiberglass and are installed around your existing porch columns. Note; however, they are not for structural purposes. 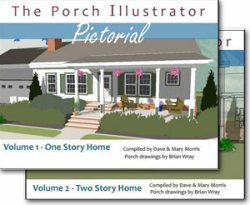 We encourage you to explore our porch column section for more ideas. Railings do more than prevent you from falling off the porch; they can add immense charm to small front porches like in the photo above. You can opt for standard balusters (pickets) or go for a design that is more decorative. This design works well for a small porch. Notice the pickets are proportional to the columns making it aesthetically pleasing to the eye. 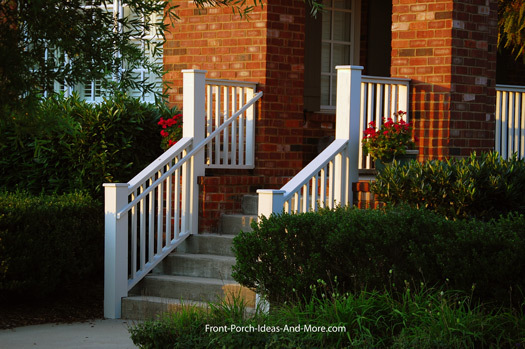 Not all porches need railings; however, hand rails are always a good idea. 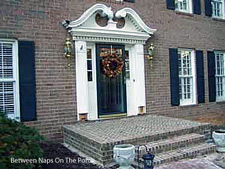 These wrought iron hand railings (photo above) contribute to the porches sophisticated appeal. 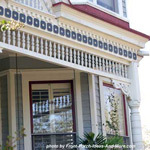 Porch railings should complement the architectural features of your home. The railings in the photo above appear to be substantially "heavy" which work well with the brick facade of the home. Columns and railings should match architecturally also. Note the very close spacing of the balusters (pickets) in the photo above. Although you can vary the spacing to create different effects always ensure you are in compliance with local building codes. Most codes require spacing be 4" or less between balusters. That still gives you lots of design options. Although this railing would not be to code in most places (due to the spacing) it could be replicated to comply. 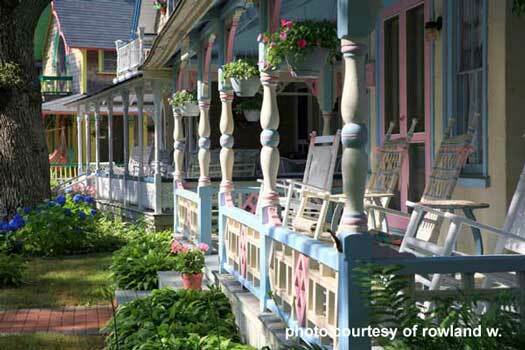 Interesting railings give small porches some what Mary and I call "pizzazz"! 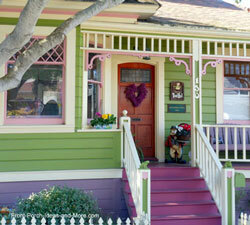 Note the colorful front door - another easy way to add curb appeal. 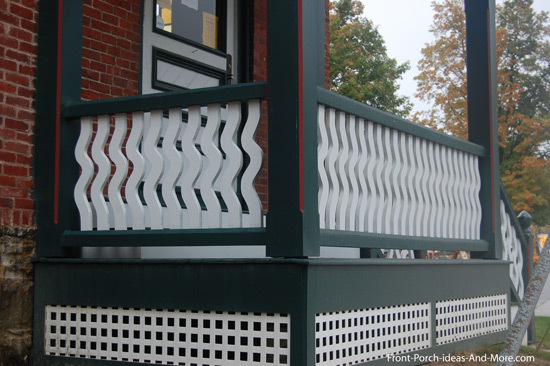 To fully appreciate all of your options you owe it to yourself to explore our entire porch railings section. 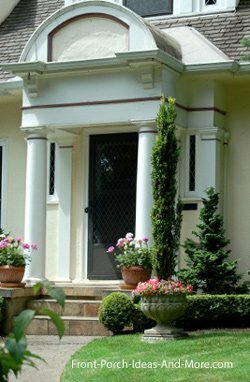 You will be able to match not only your columns to railings but also ensure they match your architectural style for maximum interest and curb appeal. Add a simple, small bench. You can put potted plants on it or use it as a place for guests to sit and chat. Also comes in handy as a shelf for packages when you need your hands free to open the door. Have your children or grandchildren make stepping stones with their hand prints, foot prints and beautiful pebbles and gems. 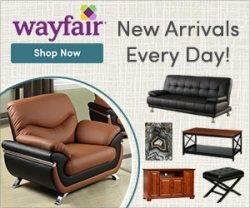 Hang banners or wall ornaments. Furnishing your small porch can take some ingenuity. You usually just don't have the space for large furniture or other decorative items. Not to worry. 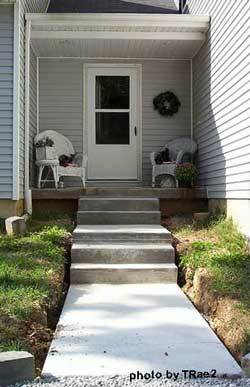 Here are a few examples and ideas the work well on any small porch. It is important to use the space you have well. The tendency is to one, add too many items or two, not add hardly any at all. Balance is key. 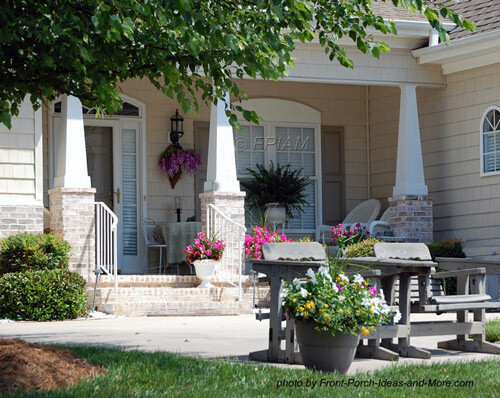 In the photo above, both the size of items and their locations adds to the comfort and appeal of the porch. Take note of the wall hanging displays in the two photos above. These give the porch visual height (not all objects are the same height) and make it interesting. A trick is to make your wall hanging a focal point on your porch. This is especially important if your porch has a knee wall as in the photo above. Otherwise, your porch becomes nondescript. 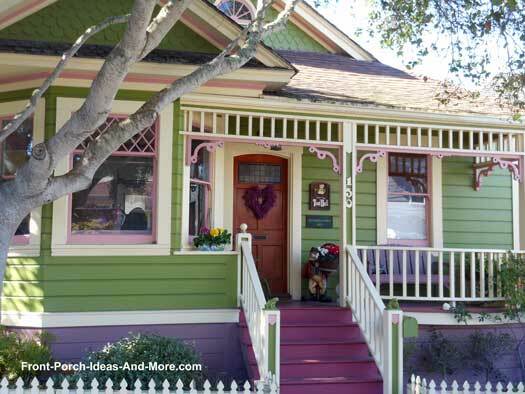 Give your furniture new life with paint as in they have done on the porch above. If that isn't possible go for colorful cushions. 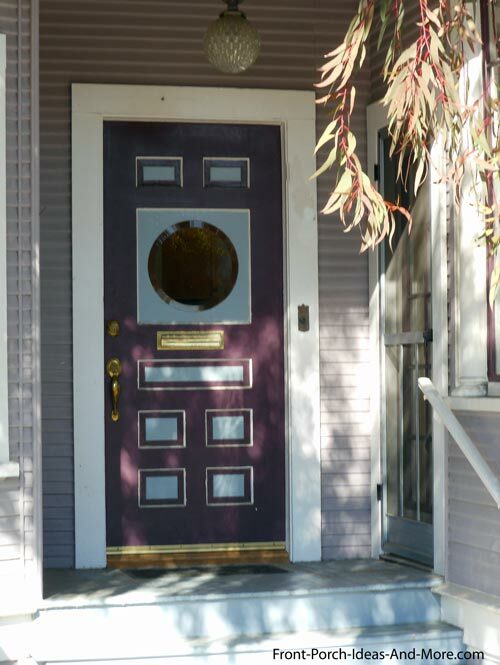 Creating a focal point is key to attaining an inviting entrance. One way to do just that on a small porch is focusing on your front door. You don't have to invest a lot to get a huge return. So be creative and find your paint brush today! 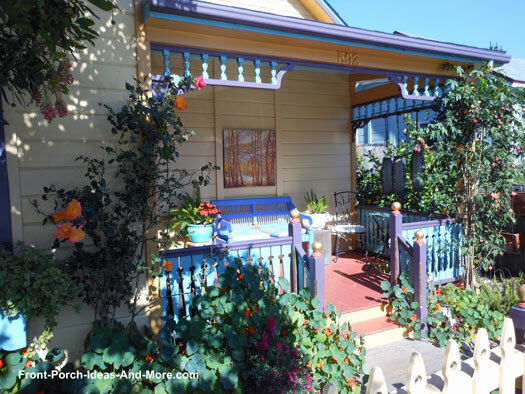 This small porch seems to capture it all - hip style roof, eye-catching colors, innovative railing design, stained glass windows, and most of just darn right charming! 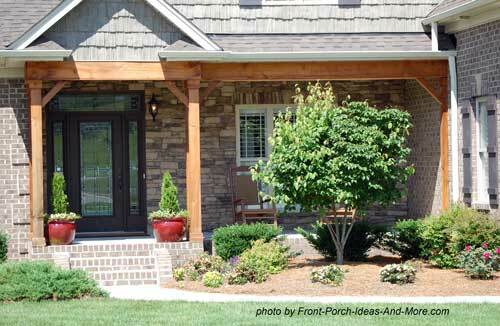 Enjoy seeing our entire porch pictures section from which you can get even more great ideas. 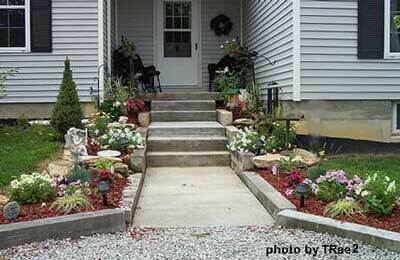 See how these homeowners turned an ordinary small porch into a truly pleasing porch by adding a new walkway, steps, and great landscaping. They painted the white wicker chairs black and planted Oriental lilies in the back. TRae2 says it was a "labor of love." 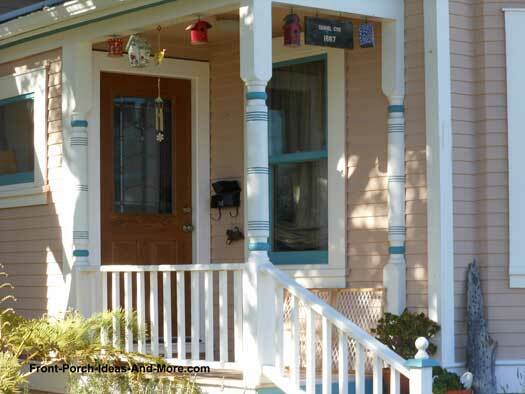 Susan's beautiful front porch is not large, but it certainly is abundantly charming and inviting. Her new front porch was inspired by a couple pictures from Southern Home magazine that she carried around with her for a long time. See her entire story along with photos of her front porch remodel with us. 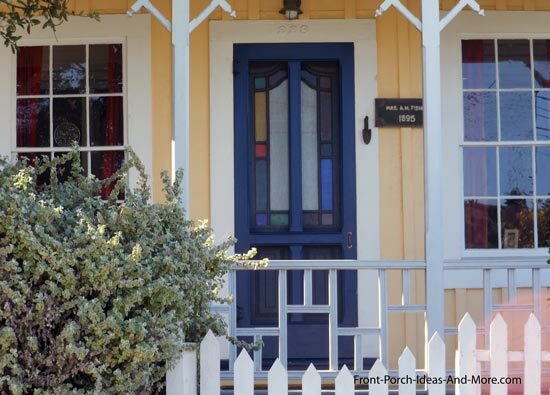 See how we decorated this small front porch and added more interest and charm. After being on the market for quite some time, this home soon had more showings and sold quickly after the mini porch makeover. Have fun seeing how everything was constructed and staged. 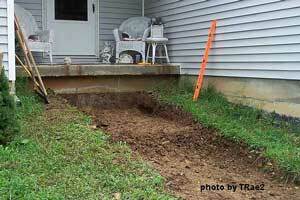 It isn't always easy or inexpensive to increase the size of a small porch. However, there are ways in which you can extend your porch without breaking the bank. The photo below is an excellent example of extending a small porch with an adjacent patio area. A patio extension allows for adequate seating and improves your home's curb appeal at the same time. The porch extension above is covered with a porch awning while landscaping provides privacy. Most small porches have an adjacent area that can easily and relatively inexpensively, be turned into a porch extension. The patio extension above is covered with a pergola-style roof. This allows for shade during the day and along with the right landscaping becomes an integral part of the original porch. Almost anyone can extend their small porch. See our porch extension section to find the right patio design for your small porch. We even walk you through the process of creating your own porch extension. 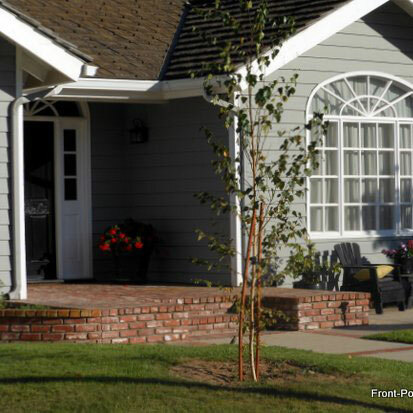 We help you envision what a new or remodeled front porch can do for your home. We show a basic ranch style home design and add over 15 different porch variations, ranging from small porticos to an expansive front porch. 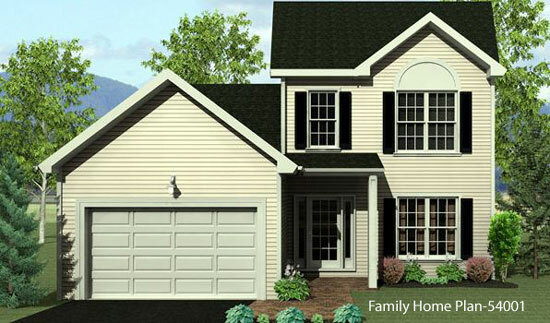 Have a two-story home? Not to worry. 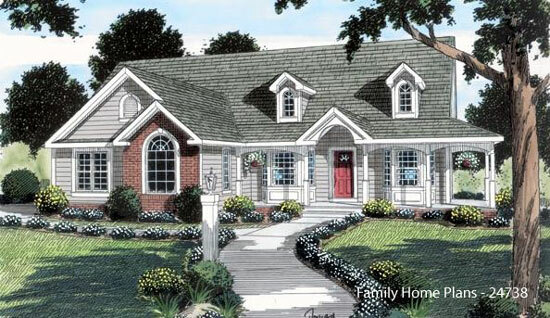 We use a two-story brick home and give you 17 different porch variations plus landscaping and walkway ideas too! 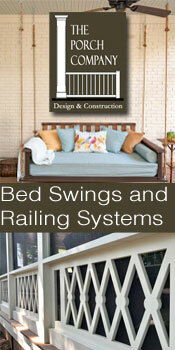 Our goal is to give you porch design ideas you can use on your own home. 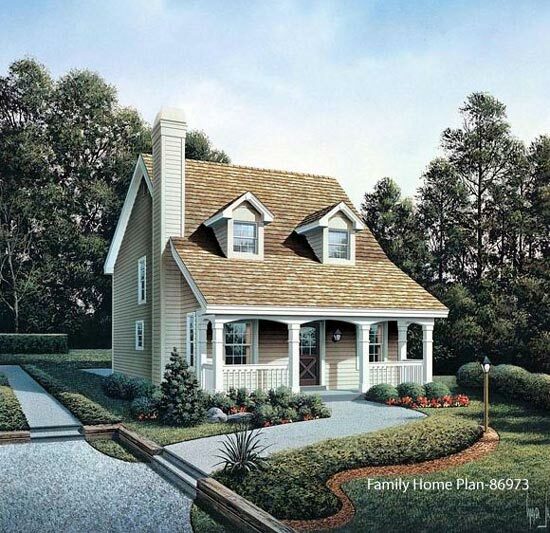 "Helping You Create the Porch of Your Dreams"
Here are some home and porch plans that you can acquire from Family Home Plans to build your home or perhaps use for adding a great porch. Photo is courtesy of Molajen. What a charming small front porch in Ontario; the wicker chair sure is inviting. 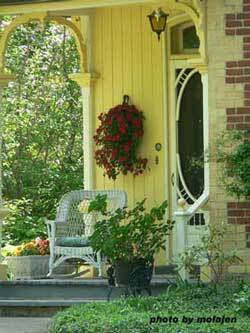 I love the hanging basket against the yellow home - and the old-fashioned screen door. 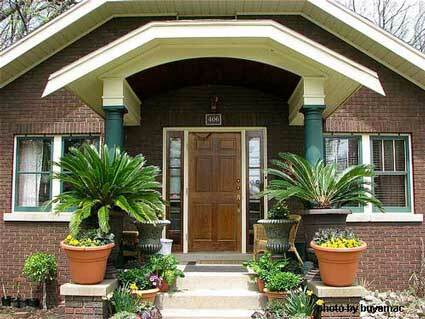 The planter and potted plant add a lot to this very charming porch. Did you get some nice ideas for your small porch? Now take a few moments to enjoy our other small porch pages. See our list below and thanks for being here. 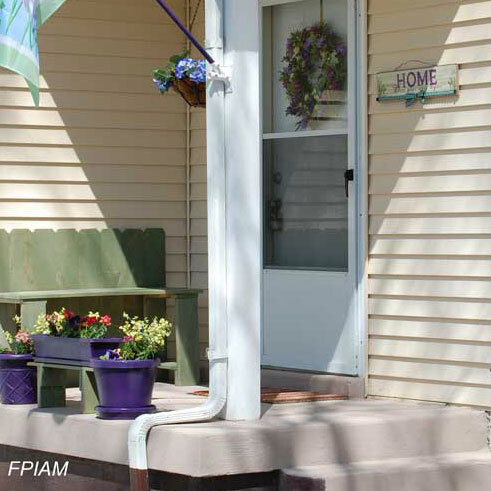 See how our friend Susan remodeled her front porch - what a difference it makes! 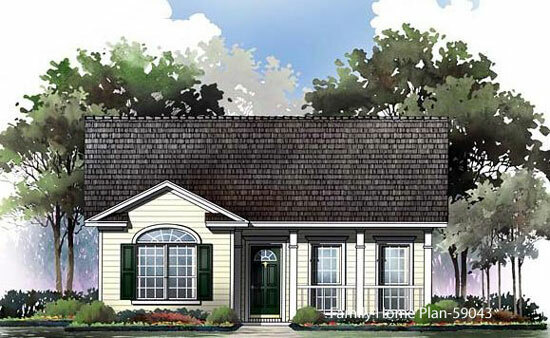 See these amazing small home floor plans complete with front porches of course!